When it comes to making a guidebook, a number of factors go into impacting its usability, such as size, layout, and navigation. One area that comes to mind when looking at these two guides side by side is structure, or how the entries (buildings) are organized. 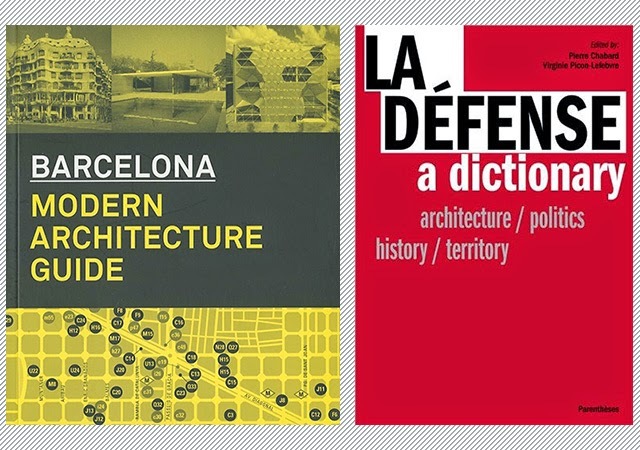 In the case of Actar's guide to modern architecture in Barcelona, the many projects are grouped historically/geographically/chronologically. 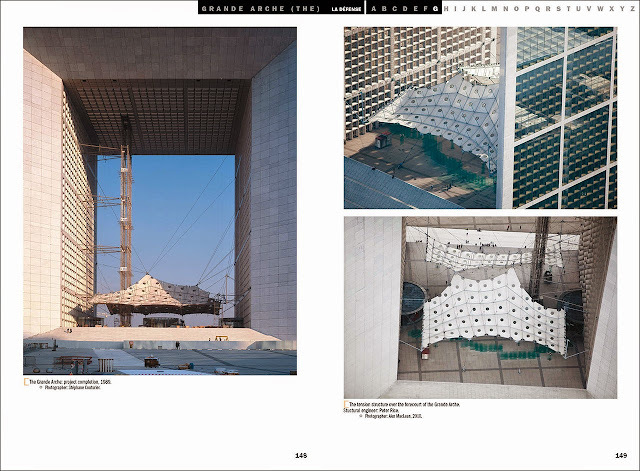 For its guide to Paris's La Défense district, Edition Parenthèses opted for a dictionary format, an alphabetical listing of places, architects and other topics. 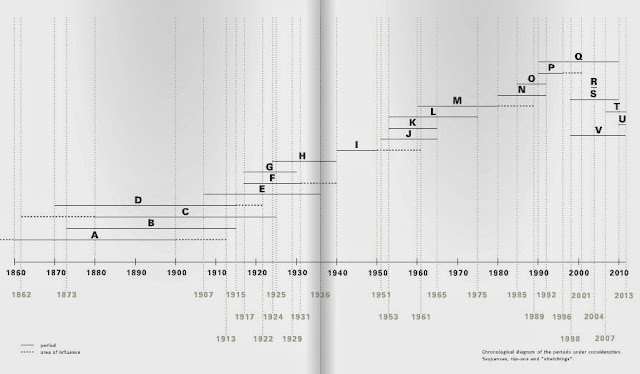 The histo-geo-chrono format of Barcelona is evident in the spread below that displays the book's 22 chapters, A through V. According to the editors these chapters follow "a combination of historical, geographical and cultural criteria," such that there is plenty of chronological overlap that occurs. Chapter H, for example, is titled "Rationalist-Style Architectures" and Chapter S (one of the updates to the first edition from 2002) is titled "Urban Recycling and Functional Complexity." These thematic titles attempt to make sense of the architecture as well as the urban plans impacting developments in certain periods. Within each chapter buildings are numbered and given either a half-page, a full-page, or a two-page spread as in Gaudi's Sagradia Familia, below. All of these entries have data (architect, address, etc. ), text and a photograph, but the full-page entries also have a drawing, and the two-page spreads have more of each. In addition to these entries, many are presented four to page with just the data and a photograph. This rational organization within the chapters creates an obvious hierarchy, with important projects getting more space. All of the entries are keyed to maps that are followed by an architects index and bibliography at the back of the book. 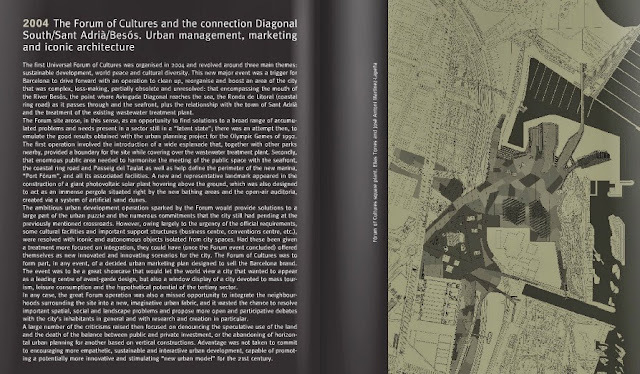 The structure and layout make for a thorough guide that is packed with hundreds of buildings and a good deal of insight on the physical evolution of Barcelona. 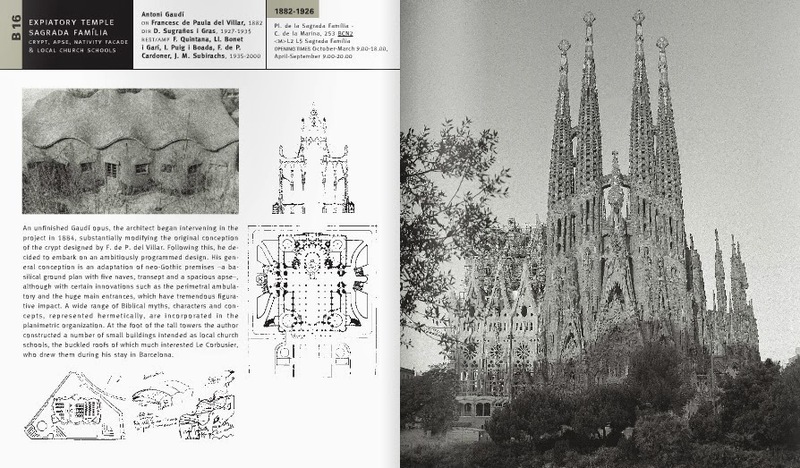 The book makes me want to visit the Catalan city even more, but it would do an even better job of doing so for lots more people if Actar splurged on a four-color printing rather than just black and white. Not only would the photographs of the buildings look that much better (some are overly dark, it should be noted), so would the many regional and urban plans (spread below) that should help explain each chapter; as grays, those plans look confusing rather than helpful. Otherwise the book is an excellent (if thick, at 600 pages) guide for architects and architecture lovers heading to Barcelona. 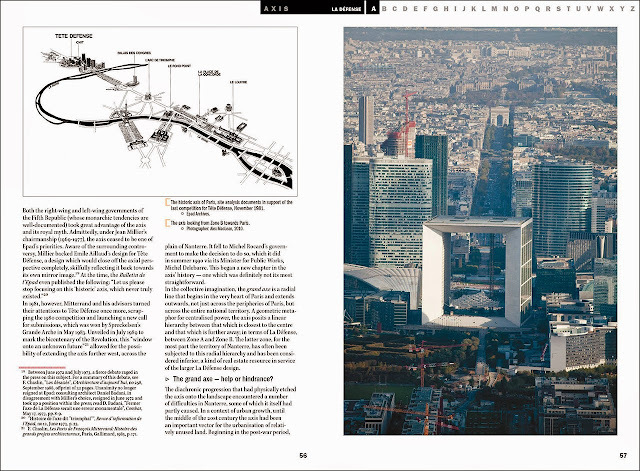 While Actar's guide to Barclona is meant to be held while traversing the city, the larger "dictionary" of La Défense is a guide that can be enjoyed at a distance. Rather than discussing the place's history, architecture, landscape, and politics in a geographical or manner suited to "on-the-ground" guides, the dictionary format brings it closer to Wikipedia. This comparison goes beyond the book's format or structure, as each entry is cross-referenced with other entries, allowing ever-expanding thematic readings throughout the book. One may start with the well known "Grande Arche," (first spread below) then move on to "Axis" (second spread below) then "Zone A," and so forth. The cross-referencing enables for readings that jump around the book, rather than prioritizing a front-to-back reading of the book. Like a dictionary, the book is in alphabetical order, and like a dictionary this is to organize entries and make information easy to find. But unlike a dictionary, the entries in La Défense range from the brief to the lengthy, using text and images to paint a highly detailed picture of one of the most interesting, if least understood, parts of Paris. So much unlike the Paris that people think of when they think of Paris (and tied to that part of Paris through an invisible axis that extends to the Louvre and is bisected by the Arc de Triomphe), La Défense is ripe for a guidebook, if anything to see how it has evolved in 50 years. The dictionary format also allows the book to be about more than just buildings. 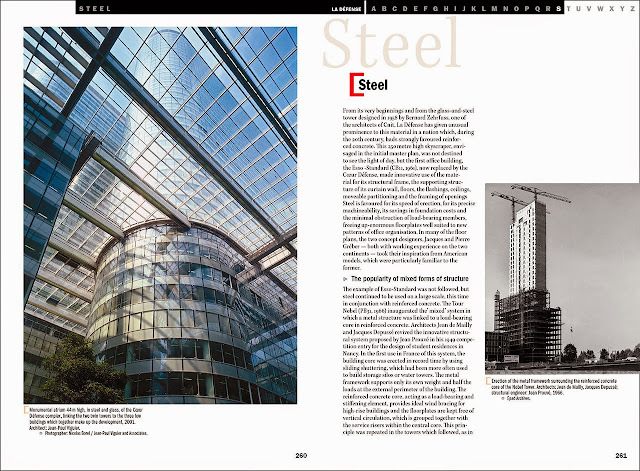 As its subtitle indicates, this is hardly a strict architecture guidebook, though the buildings and architects of La Défense play a large part in the place's evolution. The place's politics, history and territory (landscape, planning, etc.) are also explained, but so it popular culture, sociology, economics, and art. The format creates a broad canvas for what I referred to as a painting of La Défense. (It makes me wonder what other urban districts deserve a dictionary: Rome's EUR comes to mind, as does Brasilia and the lost Kowloon Walled City.) It's not surprising that of the few Edition Parenthèses books translated from French to English, this is one of them.